This Intelligence Community (IC) Directive (ICD) establishes Director of National Intelligence (DNI) policy and specifies responsibilities for the oversight, management, and implementation of IC open source activities . This ICD recognizes and establishes the roles and responsibilities of the Assistant Deputy DNI for Open Source (ADDNI/OS), the DNI Open Source Center (the Center). and the IC to ensure efficient and effective use of open source information and analysis. 1 . 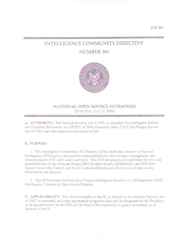 Pursuant to the IRTPA, the DNI is committed to ensuring the active and efficient use of open source intelligence, information, and analysis by the IC through the establishment and maintenance of an effective, reliable, and collaborative capability that provides maximum availability of open source information to all consumers, optimizes resource utilization,and establishes effective burden sharing. a. Open source strategy development, programmatic oversight, and evaluation will be centralized under the ADDNI/OS. Open source activities will be executed in a distributed manner. b. Elements will leverage burden sharing, partnerships . and outside capabilities (IC, public, private, other US Government (USG) and foreign partners) to the maximum extent possible . c. Organizations acquiring and/or exploiting open source information and developing open source specific capabilities,’tools will share their information and capabilities to the fullest via the Associate DNI/Chief Information Officers (ADNI/CIO) information architecture. (1) Prior to acquiring and/or exploiting any major new capability or tool, the implementing organization must coordinate with the ADDNI/OS to validate consistency with community strategy and to preclude duplication of effort . (2) After acquiring and/or exploiting a new capability or tool, the implementing organization must tag the information in accordance with IC standards and make available all information (acquired, processed, analyzed,) and tools/capabilities to other community elements unless expressly prohibited by law, DNI directive, or contractual obligation . d. IC open source efforts support a wide range of intelligence activities, including all-source analysis, and human, signals, geospatial, and measurement and signature intelligence . Open source reporting and analysis are also considered intelligence products . e. All open source exploiters, to include analysts, will exercise appropriate tradecraft and information security practices in accordance with DNI standards and policies . g. IC elements will develop metrics for overall open source activities and for individual major initiatives. These metrics will be coordinated with the ADDNL/OS and will be used to determine return on investment and customer satisfaction and to inform strategy development and resource decisionmaking. a. The DDINT/C is authorizes to establish an Open Source Board of Advisors . The Board will be comprised of senior experts from inside and outside the USG, will provide advice to the DDNI/C and the ADDNI/OS on open source matters, and will be available to consult with other ODNI and USG organizations, as needed. b. When established . the Board will develop and publish, a charter for approval by the DDNI/C. THe charter and membership will be reviewed by the DDNI/C and the ADDNI/OS annually. a. The Center serves to advance the IC’s exploitation of open source material and nurtures acquisition, procurement, analysis, dissemination. and sharing of open source information products and services throughout the USG. b. Under the guidance of the DNI the D/CIA serves as the DNI’s Executive Agent for the Center, with day-to-day management delegated to the Center director and operating the Center under all relevant authorities available to the CIA. The Center director reports directly to the Deputy D/CIA in executing strategy, policy . and program guidance established by the DNI The ADDNI/OS establishes open source strategy, policy, and prograrm guidance for the Center and other IC elements . The CIA ensures the center consults with and provides insight into Center activities to the ADDNI/OS and other ODNI elements . The DNI provides formal tasking to the CIA for the Center .